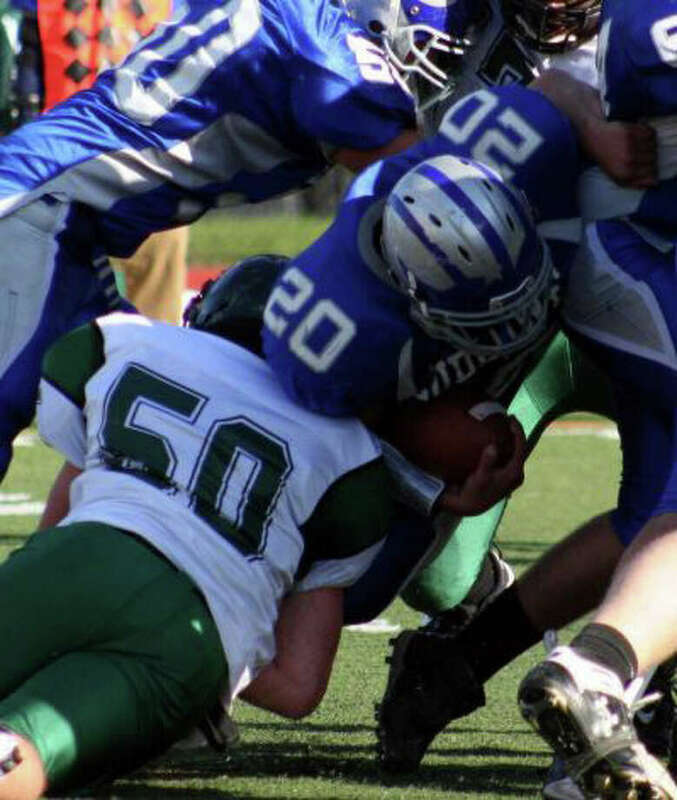 Fairfield Ludlowe running back Patrick Ferrio, 20, runs for a gain in the team's 2010 game against Norwalk. Ferrio will be a captain for the Falcons in 2011. For Fairfield Ludlowe football coach Matt McCloskey, the fourth year feels familiar. "It feels like the first year I was here," he said. McCloskey's inaugural campaign on the heels of a 1-9 year, with a strong junior class and good senior leadership. After finishing 2009 with a 6-4 season and reason for hope, the Falcons crashed to a 1-9 debacle in 2010. Ludlowe struggled to find an identity early in the season-- falling to lowly Harding-- and had its two-game win streak over Warde snapped on Thanksgiving. Ludlowe only graduated eight, but some were valuable members. Nate Ryan, who was a three-year starter at running back and corner, graduated. Quarterback Tom Hammons-- who guided Ludlowe to success out of the spread option-- is gone as well. "They were two tremendous athletes," McCloskey said. Ryan's backup at tailback Ryan Moore has transferred also. McCloskey is going to use the spread again, bailing on the traditional drop back formation it used for the first three games in 2010. Junior Tommy Howell will be the quarterback, with returning senior captain fullback Pat Ferrio and sophomore Warren Davis filling out the team's backfield. "I'm excited to see what we have," McCloskey said. Senior captains Mike Nagy, Mike McQuade and Clint Kaczegowicz will anchor a big and experienced offensive line. "We have a great core of captains," McCloskey said. "We have a pretty big offensive line." If Howell needs a receiver to throw to, Danny Silvestri and Vic D'Ascenzo will be his options. McCloskey said D'Ascenzo has "hands like glue." He'll also serve as the team's kicker and a defensive back. On defense, Kaczegowicz and McQuade will try to pressure the quarterback and slow the running game for a unit that allowed 301 points a year ago. Nagy and Ferrio will be linebackers, and try to be more aggressive. "We want to improve on stopping people," McCloskey said. "Our defensive mentality is `let's go after the ball', which is my mentality." The schedule does no favors for Ludlowe, as the Falcons' first three games are the two FCIAC championship competitors-- Darien and Trumbull-- sandwiched around a trek to Ridgefield. Ludlowe will travel to Greenwich and also take on highly touted McMahon. "Any given week anything can happen," McCloskey said. "There is no such thing as an off week in the FCIAC." But if opponents do discount the Falcons because they only won a single game a year ago, McCloskey believes his squad will pounce. "I think we're going to be very competitive," he said. "If teams underestimate us, as long as we stay healthy, we're going to be competitive in all of our games." McCloskey continues to preach patience as he enters his fourth season at the helm. He was encouraged by the varsity squad's willingness to work out in the offseason. "We had almost 50 kids here over the summer every day lifting," he said. "We had a tremendous summer of lifting and running." He and his staff are also hellbent on washing the miserable taste of a year where losses and disciplinary action against players were both prevalent. "You have to deal with what you have to deal with, it's public high school football," McCloskey said. "It takes time to build, it's a process." Growth is also an important word, because the majority of the players were young in 2010. "You have to remember 50 percent of our starters were sophomores last year... and they were scared to make mistakes," McCloskey said. "They have a year of playing time under our belt now." McCloskey is also confident in his program's direction, despite only winning one game a year ago. "It feels like we're coming back," he said. "I expect good things."